Get yourself ready! Stand up and say to them whatever I command you. Do not be terrified by them, or I will terrify you before them. "I will terrify you before them." This divine pep talk has some frightening implications. Who are you more scared of--people or God? Who is the one really in charge here, who calls the shots and is sovereign over circumstances? The answer is clear, so Jeremiah obeys. He isn't alone though; God clearly promises to be with him and protect him along the way. His purpose is to please God, not people. They promise to trust and obey Jeremiah, to listen for God's heart and be faithful to His guidance. After ten days of prayer and listening, Jeremiah tells them to remain in the land of Israel and not go to Egypt. Whatever you do, just don't go to Egypt. How do the people respond? They call Jeremiah a liar and head for Egypt, the very thing Jeremiah told them not to do, the act they promised they wouldn't do. The results: God's judgment continues to pour out on the Israelite nation and Jerusalem burns at the hands of Babylon. 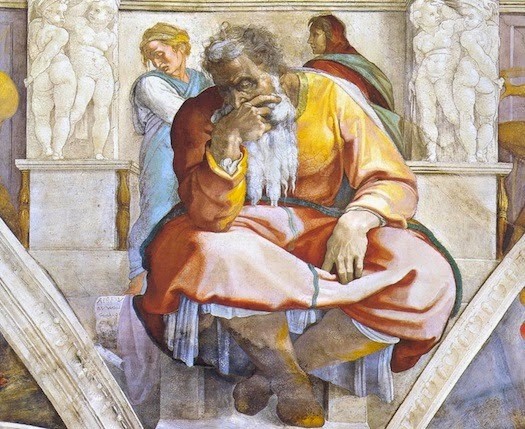 God continues to remain faithful to Jeremiah to the bitter end, and He promises a future salvation for His people. But the present remains pretty bleak, and Jeremiah never experiences a significant "success" moment in his ministry. When I am discouraged in ministry, I have to come back to the specific vocational calling God has revealed in my life. It's not about my own frustrations, nor is it about my personal triumphs. My motivation must stem from outside myself in the mission God has invited me to join. Think Jeremiah who was called by God at a young age to be God's voice to His people. Jeremiah preached and prayed and prophesied for his entire life. The result? No one listened, the people continued their downward spiral into sin, and ultimately were dragged away into exile while Jerusalem burned. Was Jeremiah a successful ministry leader? Not by our standards. Zero converts, tons of sinners, and the city burned down. He didn't write a best-selling book (in fact, Jehoiakim burns Jeremiah's scroll). He didn't have thousands of followers or a thriving multi-site megachurch, unless you count exiles in Babylon, Jerusalem, and Egypt as "multisite." He probably wouldn't have been invited to speak at leadership conferences, as he likely would have cried the whole time anyway. Faithfulness is success. Was Jeremiah faithful and obedient to the calling God gave him? Yes. That has to be our standard for success as a leader in the church. We need to fear God, not people. May you hold fast to the truth of who you are in Christ and your vocational calling, regardless of circumstances, people's opinions, or the apparent response. Our metrics for success in ministry must be obedience to Christ. What is your metric for success in ministry? Are you fearing God or people?